WebGoddessCathy: Who needs a rest? I wish this had been Mom and I on Saturday at Horseshoe Valley Ski Resort. 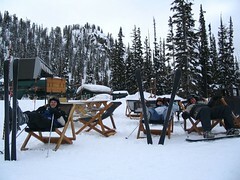 But no, this is last year at Kicking Horse. When the vertical drop was 4,133 ft (1,260 m) and we had to take a rest, put our feet up, half way down. Horseshoe has a vertical drop of 308ft (94 m). Yes, the problem is that Mom and I have been spoiled. Well, we're trying to practice up for our upcoming ski vacation in the Rockies. Only a couple of weeks left! At least the weather on Saturday was nice and we had great company. Sad that the resort wasn't as good as what I remembered from when I was first learning how to ski. On the positive side, at least I can tell that I've improved. I even managed to take a few jumps, ski all of the black diamonds (which are really just green runs by Rockies standards), and even take a crazy jaunt through the trees. Oh, and a not-the-most-success run through the moguls (which reminds me - I need a class in how to ski moguls). Goodness, I wish Blue Mountain weren't so icy and far and busy on the weekends!